The ubiquitin-proteasome system (UPS) is one of the major mechanisms for controlled proteolysis which is a crucial determinant of many cellular events in eukaryotes. Degradation of a protein by the ubiquitin-proteasome pathway entails two successive events: the covalent attachment of a K48-linked polyubiquitin chain to lysine residues in a substrate protein leading to its recognition and ATP-dependent proteolysis by the proteasome. Ubiquitylation of protein substrates occurs through the sequential action of distinct enzymes: E1 (ubiquitin-activating enzyme), E2 (ubiquitin-conjugating enzyme) and E3 (ubiquitin ligase) (FIGURE 1). The specificity of ubiquitin-dependent degradation derives from the many hundreds of E3s that recognize specific substrates through dedicated interaction domains. Characterization of the various E3s and their respective substrates and understanding the signals that regulate specific ubiquitin ligation events might be an important step to further our understanding of mechanisms controlling cell differentiation. E3s can be divided into two general classes based on one of the two characteristic protein motifs: (i) E3s of the HECT domain family that function as ubiquitin carriers and (ii) E3s of the RING domain family that do not have inherent catalytic activity but use the RING structural motif to recruit and direct an E2 enzyme towards specific substrates. The RING-E3 are further divided into two subclasses: single subunit E3s in which the substrate-binding site and RING domain are in the same protein, and multisubunit E3s in which the substrate-binding site and RING domain reside in distinct proteins. The human ASB2α, the mouse ASB2α and the fish Asb2b proteins shared the conserved N-terminal domain shown to be critical for the recruitment of filamin A (filamin A recognition motif; Lamsoul et al., 2011 and Métais et al., 2018). The human ASB2β, the mouse ASB2β and the fish Asb2a proteins harbored a ubiquitin-interacting motif (UIM; Bello et al., 2009 and Métais et al., 2018). We have demonstrated that, by interacting with the Elongin BC complex, each ASB2 isoforms can assemble with a Cullin/Rbx module to form an E3 ubiquitin ligase complex that stimulates polyubiquitylation by the E2 Ubc5 (Heuzé et al., 2005; Bello et al., 2009; FIGURE 1), strongly suggesting that ASB2 isoforms target specific proteins to destruction by the proteasome. In collaboration with the group of Odile Burlet-Schiltz (IPBS), we have set up original strategies that enable the identification of E3 ubiquitin ligase substrates that have to be degraded in physiological relevant settings. Indeed, we used label-free methods for quantifying proteins differentially expressed in extract of (i) cells expressing the wild-type ASB2α or an E3 ubiquitin ligase defective mutant of ASB2α (Burande et al., 2009); (ii) primary cells of conditional ASB2 knockout mice or of their control counterparts (Spinner et al., 2015); (iii) heart extracts of ASB2-/- knockout or control E8.5 mouse embryos (Métais et al., 2018). FIGURE 2. Volcano plots from MaxQuant quantitative analyses of protein expression differences between heart extracts of ASB2-/- and control E8.5 mouse embryos as a function of statistical significance. 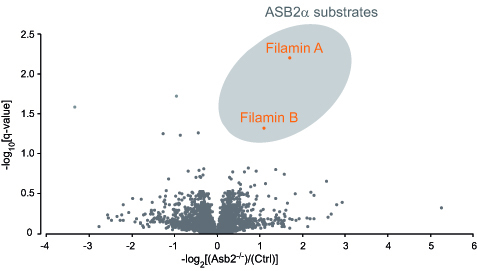 Out of more than 4000 identified and quantified proteins, filamin A and filamin B were the most significant proteins increased in ASB2-/- hearts. TUBEs were initially developed by Manuel S. Rodriguez to capture ubiquitylated proteins (Hjerpe et al., 2009; Aillet et al., 2012; Lopitz-Otsoa et al., 2012). TUBEs consist in the multiplication of Ubiquitin Binding Domains to efficiently capture endogenous ubiquitylated proteins from cells, tissues, organs and samples from patients, increasing the value of the collected information. Using a TUBEs-mass spectrometry approach, we and others have identified ubiquitylated proteins from distinct cell types and physiopathological conditions.